Got some good news and now I need your help! Thread: Got some good news and now I need your help! My son-in-law, who has been in the US Navy for many years, was on the Chief Petty Officer selection list pulished yesterday. This is a terrific promotion for him and I believe he will put on CPO on September 16th! That is the good news. I would like to make a quilt for him to memorialize the occasion. 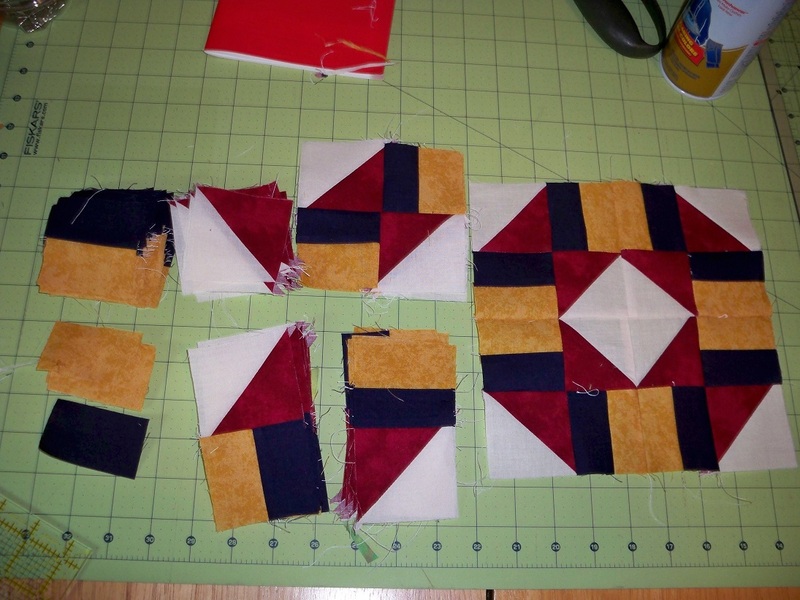 I am having trouble finding a US Navy quilt pattern that is not too difficult, so I could get it done in time. Do any of you have any ideas or knowledge of where I could get a pattern? I am not good at designing my own and I am not particular whether is is a free pattern or whether I have to purchase it. 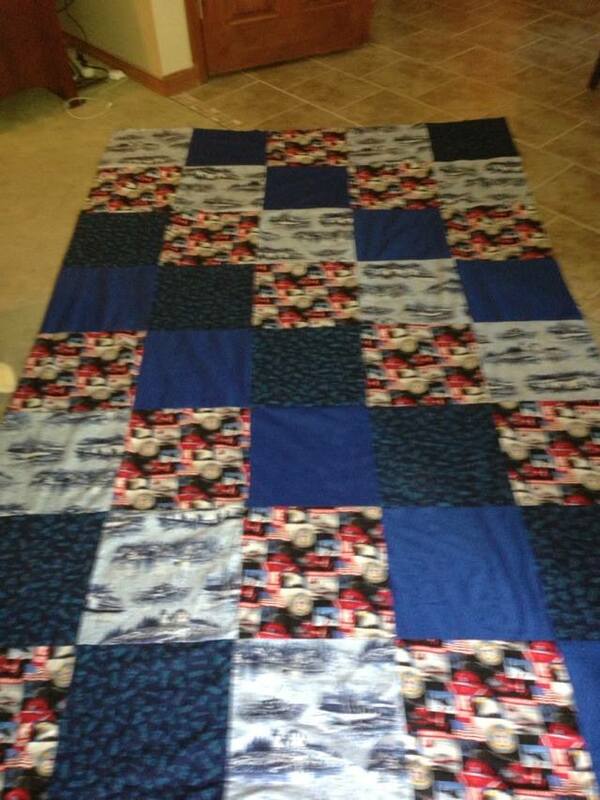 I would like to make the quilt in the Navy blue and gold, with red and white accents. Any input from anyone would be appreciated! What an honor for him! Does it have to have the navy emblem? If so I'm sure there is fabric out there with that on it that you could use as either focus or accent. Either way, I would mainly let the colors speak for themselves. Maybe try googling quilts of valor for ideas. I know Walmart used to have pillow panels with Navy theme. 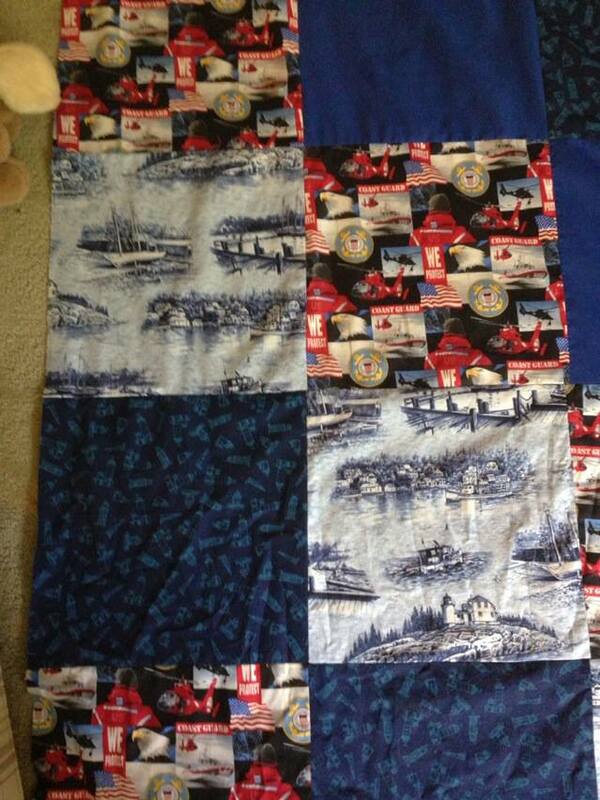 I used the ones that are Marines and Army in donation quilts and for my son. Last edited by Annaquilts; 08-02-2013 at 11:19 AM. www.4my3boyz.com has a Navy panel and naval fabrics. All branches of the military are available. Yes, that's a Z at the end of the name. 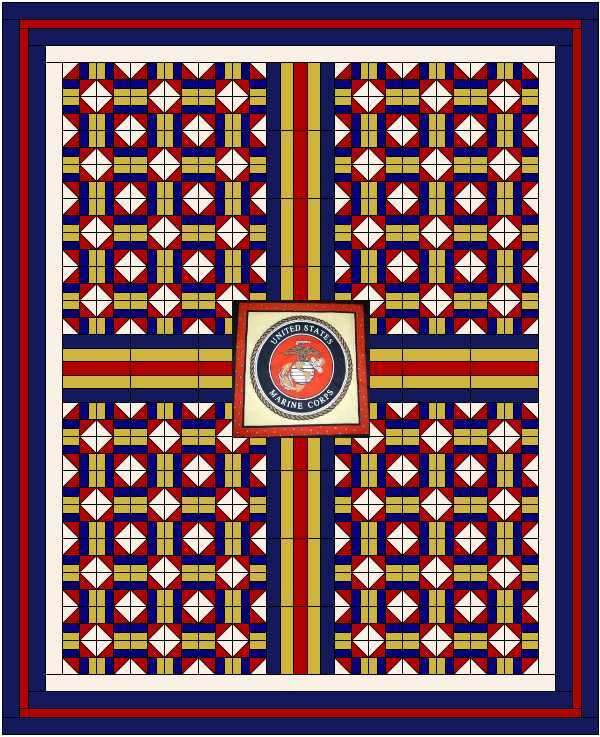 Here is a pattern I designed to make my brother a quilt, while he was in boot camp. Unfortunately, he was giving a medical discharge so I never finished the quilt. There is no particular pattern for the quilt, I constructed it from a couple different blocks. The center Marine Corp logo is a pillow panel I purchased on Ebay The stripes will be a 5-piece rail fence. And the other block is called Crossroads that I found in EQ7. You can download a tutorial here. Just note that the tutorial has an error in it, the last picture has the bottom half square triangles of the block upside down. The block was easy to put together, so maybe this will give you some ideas. Quilter's Cache has a block dedicated to each branch of military service. Here's a link to the Navy block, maybe it will work for you. This site shows some other Navy fabrics. I've seen some of these in person at our LQS and they are really nice. I'm sure they would be available in many places. I made one last year for a WWII Navy veteran. Used the panel from amy's and did a D9P of naval and patriotic prints. Went together really fast and he so appreciated it. I also had an embroiderer (?) make a nameplate for him to center under the Naval panel with the dates of induction, where he served and the ship he was on. He tells me that he will be buried with the quilt. As a matter of fact, today is the 70th anniversary of his induction date. It also had his discharge date and status which I realize doesn't apply to you. I am sure he will be so touched. Thanks for your suggestions. Each of the ideas have merit and are lovely! I will look into them and try to decide which pattern to use. I've seen military material at one of our local fabric stores, so I am hoping that they have some Navy material to use as a centerpiece. I like the Navy Star block, but don't think I could get it finished and to my LAQ in time for her to quilt it. It is indeed a great honor for him, and worthy of a quilt. I LOVE the Navy Star but think for your purpose the one Kaelyn designed is the winner (IMO). I spent 10 years in the Navy and left just as I was on the list, so I know from experience that he will love it. You're getting good direction from others, I just wanted to add my congratulations to you and your son and please, give him my thanks for his dedicated service. We need many more young me like him! I have to say, I am amazed over and over again, just how much help you quilters are!!! The ideas that have come out of the woodwork for Rubesgirl is absolutely mind-boggling!! Looks like you have some great choices to select from - tell your son "thank you" for serving. My son served 12 years in the Navy and loved it. He has a family now and decided he needed a job where he didn't spend so much time away from them. Now he and his family are only an hour away from me - I'm loving that! I bought Coast Guard material which is like the Navy material that one of the girls posted. I am in the middle of making it...top is done. My son asked for flannel backing so I just purchased that I will post what I have done so far. I used lighthouses and boat fabric to go along with the coast guard fabric. You might want to check out the many "quilts of valor" website. Lots of variety. Also FONS and PORTER did several episodes for the "valient eagle" for which the pattern is available. They also have a huge selection of patriotic themed quilts and kits (if you're in a hurry). Having spent 20 years in the Navy-I know how much this promotion means to him and he'll really appreciate the quilt. a bit wringled in the picture. I best get moving one this one. Congrats to him....and thank him (and his family) for their sacrifices!!!! What a huge step into the brotherhood of the CPO. Initiation is something to remember. Whatever you decide on, he will cherish and appreciate your honor to him. I bought mine on line, but they had Navy fabric like that at Joanns and they have it on their website to purchase. He is very fortunate. They just annouced they are doing the promotion freeze again so normally chiefs are on that one. Have you tried the Walmarts on Military Hwy or Tidewater Dr. They have Navy fabric. You could even make him a quillow out of fleece of a rag quilt. Those wouldn't take too long. The Tidewater Dr is still building up its supply of fabric but the Military Hwy has always had it and building it larger all the time. Also the Fabric Hut on Little Cr Rd might have some as well. You can always make him a throw in the fleece for now and make a really nice one for Christmas. Congratulations, I know how hard this is, it took us yrs to make it. You could also scan the Navy emblem or find it on the web...search for images of Navy emblem. Adjust the size for placement into your quilt design and print on printer fabric using your inkjet printer. I often print my labels on printer fabric like Printed Treasures. Happily buried in a heap of fabric in Indiana! Here's a link to some maybe it will help? Sew, sew, it's the threads that keep love together :>} I love sunbonnet sue,old-fashioned things like 1950's or older housewife things, and like hankies,tea towels and aprons . Thanks to some lovely members on here I now have lots of aprons in my collection !! WOW! I am completely overwhelmed by all of the wonderful replies I've received! I will certainly pass along your congratulations to him. We are so proud of him! I have pretty much decided to make the quilt designed by Kaelynagelfoot. I have looked at the pattern and although it looks complicated, the squares are made of patterns I have made before, so I'm confident I can get it done. I am going on a short vacation this week and will get started when I get back. I planned to go to Fabric Hut in Norfolk, as they have the best selection of fabrics and will order what they don't have, if necessary. I've seen many military fabrics there, so expect I will be able to find something complementary. I'd really like to keep it pretty simple, using mostly solids in the right colors. As for labels, my printer ink bleeds when it gets wet, so I can't make my own labels. I know an exceptional embroiderer who makes gorgeous labels for me. I'd rather have her make them and know that they will be as lasting as the quilt. When this is done (and I hope to have it completed and ready to give him on Sept. 16th), I will post a photo of it on the Board. Thanks again for all your support! It means a lot to me and my family. PS~ My DH is a retired SCPO! Last edited by Rubesgirl; 08-04-2013 at 06:07 AM. Wendy, I'm sure that you son-in-law will appreciate your gift to him. Please thank him for serving. Don't forget to post a picture of the quilt. God Bless.